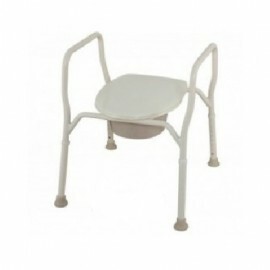 Many standard toilets are built to low and can be difficult to use as we age or after a hip or knee operation. 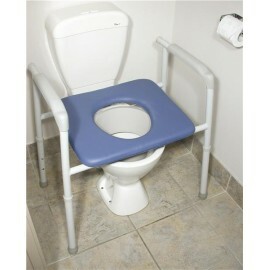 Our range of height adjustable toilet aids can be of great assistance without the need to call a plumber. We also offer equipment for hire with the option to purchase at a reduced price. BARIATRIC ALL IN ONE. 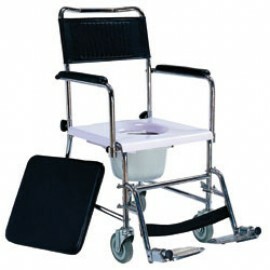 This is an over toilet aid,shower chair and commode all in one model. Sturdy stainless steel with height adjustable legs it comes standard with a splash guard, bowl and lid. 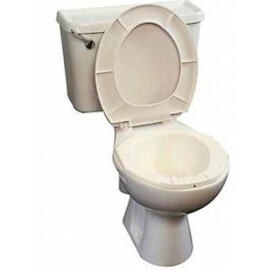 The large seat and seat cover are padded with heat sealed seams for hygiene purposes. 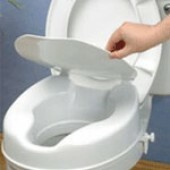 Plus the remova..
Folding Over Toilet AidThe AusCare folding over toilet aid assists transferring on and off the toilet. The folding frame ensures compactness in small spaces.Constructed of aluminium, the frame is height adjustable and weighs just 3.8kg (one of the lightest available). 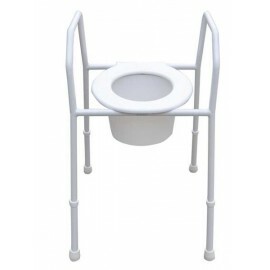 The frame has a lifetime warran..
Over Toilet Aid Ultra light aluminium frame which is height adjustable and able to place over your toilet to raise the seat height. It comes with a lid and a splash guard. Superior looking. Weight capacity : 140kgs. seat width 50cms. 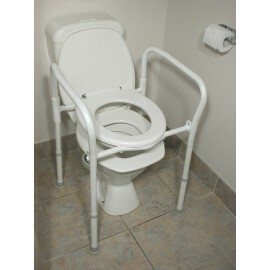 height from 44cms to 59cm ..
Over toilet aid The Days Over Toilet Aid assists transfers on & off the toilet. 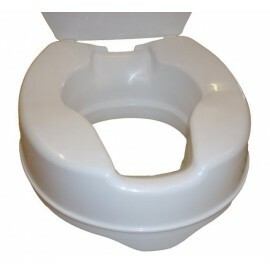 This toilet surround frame is height adjustable, with a push button adjustment. Powder coated steel frame with non slip rubber feet. Comes complete with a seat and splashguard. 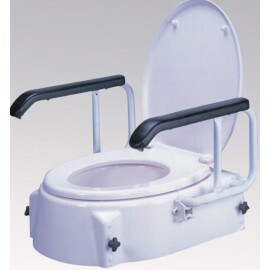 Specifications:Seat Width: 370mm..
THRONE 3 IN 1 TOILET RAIL SYSTEM. 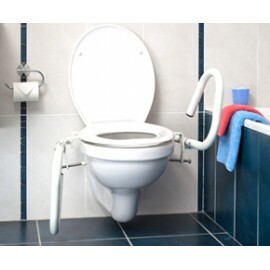 Support arms that bolt to your existing toilet to assist toilet transfers. There are three settings. 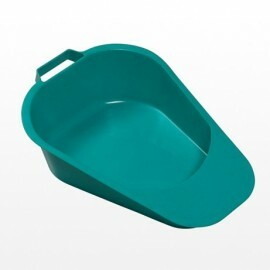 Standard , splayed or folded down and you can also purchase seperate spacers to increase the height of your toilet.Powder coated steel with a max user weight.. Toilet Raiser The 4" (100mm) raised toilet seat will assist patients in lowering themselves onto the toilet, and raising from it. 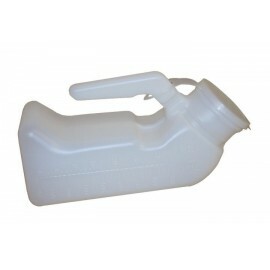 •Made of a lightweight plastic, it is gently contoured , comes complete with a lid. •It fixes easily to most toilets. •Easy tool free installation. •Also ava..
NUMO TOILET ARMS Stylish and sturdy these arms fit your existing toilet to give you support when standing and sitting. Easy D.I.Y installation. .. 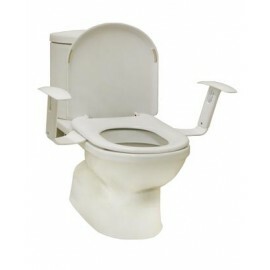 This toilet seat raiser has swing back armrests and fixes onto the toilet bowl for safe transferring (replaces the existing seat and lid). The seat can be lifted for cleaning. 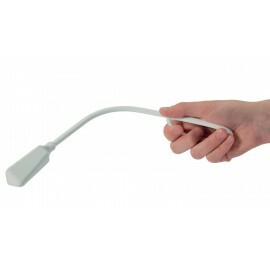 Height adjustable 5, 10, 15cm. Width between arms 41cm. 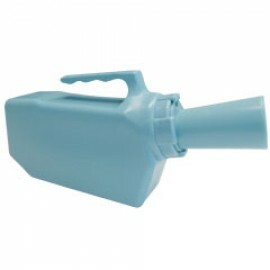 Max user weight 100kg ..
Spill Proof Urinal Bottle Designed to prevent spills, this urinal bottle is lightweight and easy to clean, with a sturdy grip it can be used in several positions by bed ridden patients. 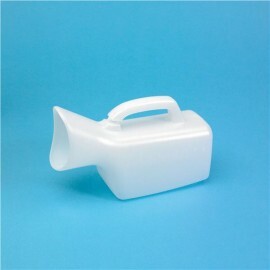 Capacity : 1,000ml Spill proof capacity : 500ml Autoclavable ..
Urinal - Female This female urinal has a handle for ease of use. 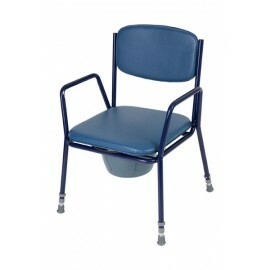 Anatomically designed to enable use when sitting, standing or lying. Capacity 800ml, with graduations for output. Weight: 110g .. 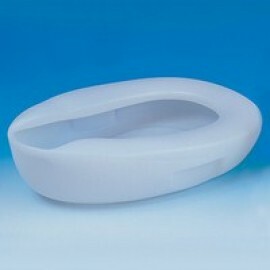 Bed Pan Made from white plastic, contoured for patient comfort. 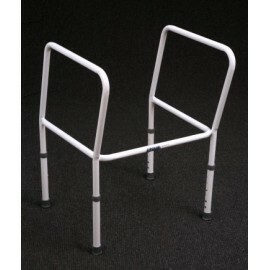 Ideal for use with immobile patients, easy to position. Easy to clean. Length 390mm Depth 45mm Weight 405g ..